What if I always want to start drawing my lines or shapes with a certain Pen/ Fill color? It is quite a common thing to use the same line and fill color when you are drawing objects in MacDraft. You can set these options as defaults for your MacDraft documents through the preferences. Simply change the Attributes for the Fill, Pattern, and line settings, go to the MacDraft menu and select Preferences. Click the Document Preferences tab and make sure that the “Fill Pattern and Colors” check box and “Line Settings” check box are checked on. Then click the Ok button. Once this has been done, every time that you open a new document, these setting will apply to the objects that you draw. Best advice for rendering high quality images. When working in 3D there is often a need to generate high quality, high DPI images. Doing this can sometimes take a long time, depending on the complexity of your scene and it is important to try and get things right the first time. Just about every 3D scene or model will include textures, therefore it is important for you to remember that the size of the textures you use should correlate to the render you are creating. If you are using repeatable textures then the quality of the textures you are using does not always need to be changed, but if you are use standard textures that do not repeat, then you will need to increase their pixel size to suit the large render that you will be creating. If I am rendering an image at 4000 x 4000 pixels, I will always try and make my non-repeatable textures 2000 x 2000 pixels. Then when you add them to the scene, you must hold the Shift key down when dragging in, that way the textures will not get sample by the application. Always remember to check how your scene looks? When creating 3D models it is always important to keep an eye of renderings of the model or scene. Interiors has a preview renderer that allows you to quickly render your scene and get an idea of how it looks with the lighting and shadows and will give you insight into areas of the scene that may need more work and attention. The RayShade renderer can take more time to generate, if you are using it to preview then my advise is to make the window size of your document small. How to make a realistic shiny glass screen? 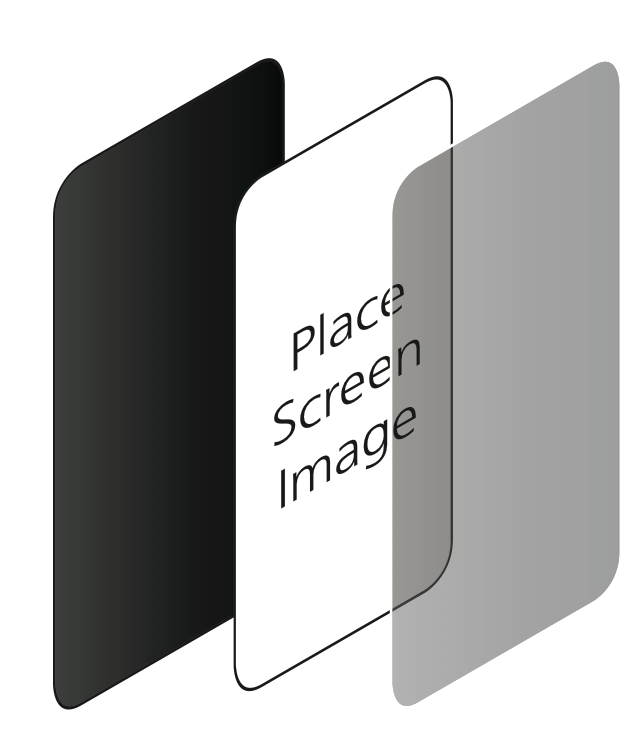 When working on this the most common way to create the screen would be to apply the screen shot of the screen you are trying to create and set the mirror setting on that to create the reflective glass effect. The way I do it is to create something much like what is in real life. Build the screen up in layers. The first would be the under frame for the screen, the second being the screen itself and the third being the glass covering. How to create a hollowed out curved shape? – To create a precise shape for this example we will need to use the Lathe tool. 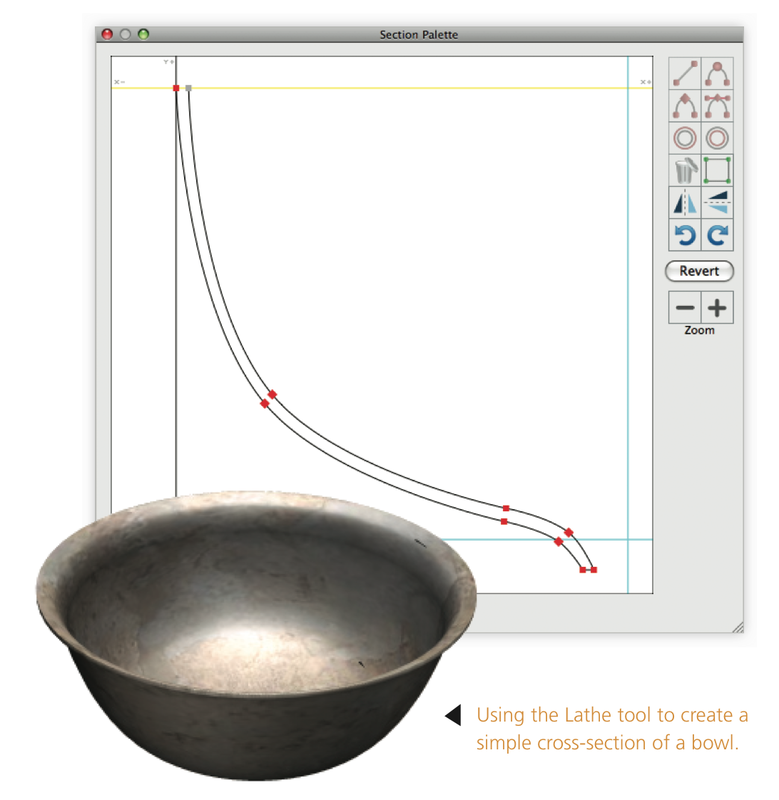 The Lathe tool is perfect for creating a cross-section for a given circular revolution shape. – The Lathe tool can be used to define the axis of revolution for the cross-section you are creating. – The way the lathe tool works is simple. You decide the axis of revolution, then you have to draw the section at which you want the tool to extrude around the axis. Below is 2 images, one showing the cross section you draw when using the lathe tool and the other is the 3D profile that is created from the Lathe extrusion. You can see from the main image, the Section Palette and the section that has been put together to create the simple bowl shape. Here is the best tip for this, when you use the lathe tool only place the basic points, then you can edit the detail of the cross- section in the Section palette afterwards. This will save a lot of time in the long run and will make it easier for you to customize the design of the shape that you are trying to create. – Draw the axis line for which the section will revolve around. – Then you will need to click the start point for the section. – Start drawing the basic points for the section and double click when you are happy. Now use the Section palette to edit the cross-section. Understanding the Model you are trying to create. 3D Modelling can sometimes be a difficult if you do not know how to build the model. The best way to overcome this confusion is to try to understand how an object is built in real life. 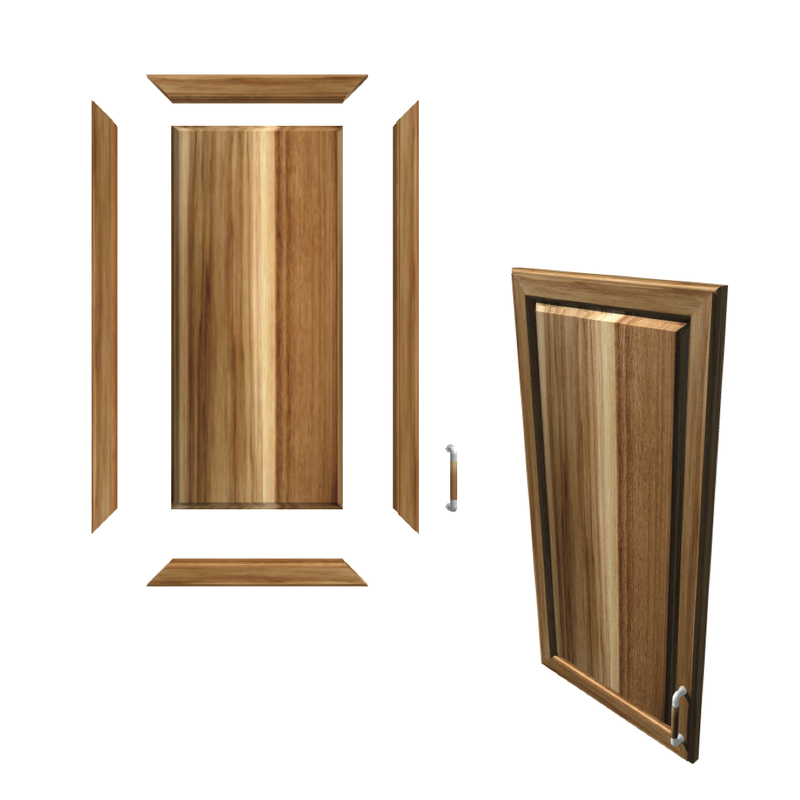 Lets take a Kitchen Cabinet door as an example. 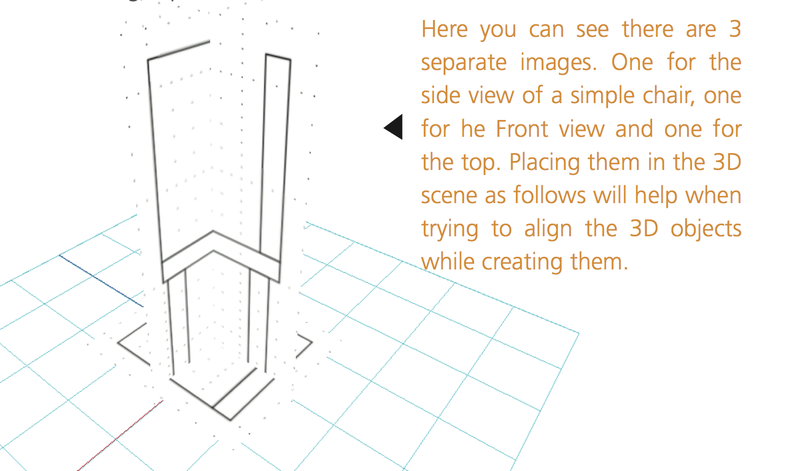 Above is an image that shows how one is constructed, you can use this to help you understand how to build the 3D Model, to get the best and most realistic outcome. Where to begin with 3D Modeling? To some the concept of 3D modelling can be a daunting process and difficult to understand where to begin. When I was starting out I found a good method that helped me to understand how to start constructing a 3D model of something. The first thing is to pick something relatively simple, that does not consist of too much detail or many complicated shapes. You then need to either find inspiration images that show different views of the actual object or CAD drawings that show all the elevations. In addition to these inspiration images, I found having an understanding of the core dimensions of the object helped me to visualize in the 3D model the scaling of each component with respect to each other. With all this information you can begin to draw your first 3D model. I would pick something like a simple dining chair to start with, and try to find some elevation drawings, that way you can place them into the 3D application as shown below, to help you line things up. Try and keep the drawing tidy. When annotating the try not to overcrowd it with large amounts of text. Try to keep the annotations to precise points and key aspects that you want the reader to know. If you want to give more information, put an star symbol (*) and a number next to the point and then add additional information at the edge of the DWG drawing. I have always found this a good help, because I can then keep the annotation on the drawing to a minimum, making the drawing itself much clearer.